Less than 24h before my new Kickstarter project will start. 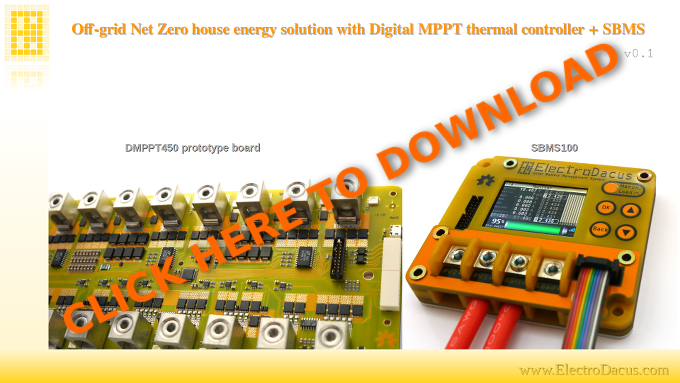 Digital MPPT thermal controller is a new concept as far as I know there is nothing like this (even if idea is quite simple) and this together with SBMS can make for a Net Zero energy house solution that will be more cost effective than any other solution in most places. I prepared a short presentation to explain the concept and all feedback is welcome. Just a suggestion - might be worth getting some independent people to review your Kickstarter page and pdf. I'm sure all of the info is there, but it is not easy to understand. Having the info in a pdf is a barrier in itself. I would suggest at least adding the system diagram to the main Kickstarter page. Also, I suggest that you add a table which explains what all of the different products are - including the old ones you mention in the text. Since it's Kickstarter you need the information be obvious, as many people won't take the time. Thanks for the suggestions. I was thinking that everyone can open a pdf even on a mobile phone and I wanted the Kickstarter page to look less crowded. Neither the SBMS or DMPPT is a toy and the one that gets something like that will need to have some knowledge and will end up spending as much as an used car for the entire system. Because of that I assumed that people will take the time to understand what they are getting. Also most of my bakers will already be familiar with me and the SMSB maybe already had supported my earlier Kickstarter. But your suggestions make sense for sure. Kickstarter is now already live and I can no longer change any o the description content. Understood - I didn't know about that restriction. My perspective was that _I_ was interested enough to go hunting for a diagram to see what an SBMS40 and an DMPPT450 does, but I just thought that other potential customers might not spend enough time to see the opportunity. Anyway good luck, seems to be off to a good start. Make a Pool / Hottub heating version. There are some Asian products - but none are great and probably not safe in any way shape or form. It has been on my todo list for a while but I have too many projects at the moment. Most hot tubs are between 1.5x1.5m to 2.5x2.5 meters so they can fit some light weight outdoor (marine) flexible marine panels on their covers. You need to create some flow to move water around a heating element - but apart from that your current product should be "easy" to modify. And customer potential is huge. Even bigger pools might benefit from PV based heat system but that would require more work. Where I live we have a "community" pool where we are researching at the moment what to do. The natural gas pool heating costs us about 15% of the entire community expense in an estate with 400 properties. The DMPPT450 can easily be used to heat a Pool or Hottub. While this is electric is safe since is ultra low voltage 30V DC and you can use silicone isolated copper cables as heat elements. No need to move the water around since the heat elements will be just 10W/m so they can be safely run even without water in free air. The DMPPT450 can support up to 14kW of PV panels so in a sunny day up to 100kWh/day of heat can be transferred to a pool and that is quite a bit of energy. What is the cost of natural gas per unit of energy at your location ? If I know that I can know if my system can offer benefits. Also if you know how much energy you use to heat the pool I can know how many DMPPT450 are needed and how large the PV array will need to be. Or you can give me the size of the pool so I can calculate the volume of water that needs to be heated. You need 1.16Wh of energy to heat 1 liter of water by one degree Celsius. There are about 800-900 litre of water in a 1.8x1.8m hottub. Usually around a 1.5-3kW heating element running (usually) on electric power - and usually ONLY when tub is running (so add 100-800 watt for circulation pumps dependent on the age. So water needs to be heated to between 28 and 40 deg. c. Incoming water temperatures in EU are usually between 3 and 10 deg c - and sometimes in the summer 12-15 but I have rarely seen that high temperatures. There are gas heated hot tubs but they are few and far between and usually very expensive and has annual service requirement. But what I'm talking about is you making it into a full product You are not getting John/Jane Doe to put in your system as it is not "mum-friendly" - your current system is for "tinker" people who like to get their hands "dirty" and know a bit. So put together a product - find the solar cell's - find some heat elements that work and are light weight - so they can be moved when you move the cover. But make it into "mum-safe" product anyone can install - and I think you will have a good source of income. So you are talking about a 25 to 35°C delta for say 800 liters of water then that will require 800 x 35°C x 1.16 = 32.5kWh so fairly significant. You will need a 4 to 5kW PV array working all day to do that. So while much cheaper than grid electricity it will only be so if you use this every day or at least in average once every two or three days but if hot tub has very occasional use say maybe once or twice a month then the investment in solar just for that is not economical and you better pay for the grid electricity. Yes in order to use my system you need to know what you are doing. But also what I propose is a complete house energy source so is not only a large total investment but also requires a lot of work that need a certain level of knowledge and skill. My two products the SBMS and DMPPT represent just the logic part (the controller) of the system and probably just 5% of the total cost. Since PV panels and all other stuff are large and heavy international shipping is not an option so there is plenty of space for local solar installers or business to open a business offering complete solutions based on my technology. I think the potential is huge since as far as I know is the lowest cost house energy solution and even better for new houses where additional savings can be had by no connecting to utilities like electricity and natural gas. The problem is that there is nothing like this as far as I'm aware so is hard to explain even to knowledgeable people what this DMPPT this is all about. No you only need to maintain the heat - or slow cook it. Hot tubs are made to keep the water in them for a period of time - some like every month - others every 3-4 months. Modern tubs have auto chemical injection - but older ones can work with pH strip and chemicals like a pool. At night you cover it so it is insulated - and loose maybe 2-8 deg c dependent on the temperature you want to maintain vs outdoor temperature vs insulation in tub. So if you need to heat 800l * 5 deg delta - you need 4kW ish which is quite a bit but doable. But the issue is not only the cost of the electricity - but the cost of connection. In Spain - you pay for your "max kW" as monthly subscription - and then your consumption on top. So if you have a 5kW spa plus normal 3kW water heater + electric heating in the house - you end up paying a connection fee for maybe 10-12kW - which is around 60-70 Euro/Month. Then on top of that you pay for what you ACTUALLY consume. And if you use MORE than your subscription the latest meters will then start limiting your consumption - giving funny outcomes here and there. If all is needed is a 5 or 6°C delta each day then 1kW PV array (4x 250W panels) will be more than enough. If that is the case you do not even need the DMPPT450 since that will add cost and maybe if you only use that when is sunny (or is mostly sunny at that location) then with a calculated heat element you can get as high as 80% efficiency and do not need the 98% efficiency of the MPPT450 for such a small system. So even a non technical person can do something like that. Just buy 4x 250W PV panels an a few meters of silicone isolated wire nothing more is need as mentioned in my presentation. There is even an example with 7 panels and fixed resistive heat element with an online simulator tool all described at page 8 in my presentation.